Protein content and protein quality are fundamentally associated with cooked pasta textural quality and are considered the most important of all the grain components that influence cooking quality (Autran et al, 1986; D'Egidio et al., 1990; Matsuo et al., 1982). Consequently, a minimum hard vitreous kernel (HVK) content is an important physical characteristic because of its relationship to protein content. 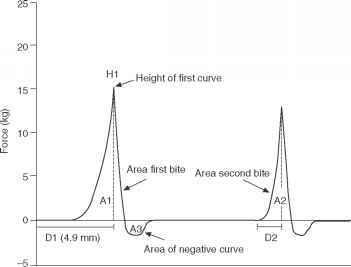 Generally, as HVK content increases and non-vitreous (commonly referred to as starchy or mealy kernels or yellow berry because of their opaque yellow appearance) kernel content decreases, protein content will increase (Dexter et al., 1988). The primary importance of protein content in determining cooked pasta texture is well documented (Autran et al., 1986; D'Egidio et al., 1990; Dexter and Matsuo, 1977). As protein content increases, cooked pasta becomes firmer and more resilient (Fig. 20.3). High protein pasta is also less sticky, although the relationship to protein content is not as strong (Dexter et al., 1983a). Pasta of high protein content will also remain firm when kept in warm water after cooking before it is served. Because of its fundamental impact on the textural properties of cooked pasta, protein content will continue to be the primary quality factor for pasta production in the future (Marchylo et al., 1998; Marchylo and Dexter, 1996). Fig. 20.3 Impact of durum wheat protein content on cooking score (cooking quality). Data taken from Canadian Grain Commission harvest survey reports. Gluten strength, which is related to protein composition, i.e. protein quality, is also universally acknowledged as an important prerequisite for making good-quality pasta (Ames et al., 1999). It should be recognized, however, that the widespread acceptance of high- and ultra-high temperature (HT and UHT, respectively) drying, has made it possible to produce pasta products with reasonable textural characteristics when using weaker gluten strength semolina. As noted by D'Egidio et al. (1990), higher drying temperatures have decreased the importance of gluten strength for cooking quality. A pasta manufacturer who uses HT or UHT drying systems must be concerned primarily with protein content. The processor knows that, as the protein content of semolina increases, there will be a corresponding increase in product quality. A qualification, however, is that semolina possessing strong gluten characteristics will exhibit less sticky dough with better extrusion properties and superior cooked spaghetti textural characteristics compared to weak gluten semolina of comparable protein content. Cooked pasta textural attributes impacted by gluten quality include bite/elasticity, firmness, hardness, bulkiness, smoothness or mouthfeel during mastication and chewiness (Cole, 1991). Scientific evidence obtained so far indicates that the continuity and strength of the protein network is directly related to the textural characteristics of the cooked spaghetti (Zweifel et al, 2003). These characteristics are influenced by total protein content, since as protein content increases so does the extent of the network. Protein quality or composition is believed to affect the properties of the protein network. Some gluten protein components are more effective than others in forming a good network and influencing the plasticity and elasticity of the resultant dough and the extent of the protein network around starch granules. As discussed by Ames et al. (1998a), initial studies identified the presence of the y-gliadin band 45 and the absence of y-gliadin 42 as a marker for pasta cooking quality (Kosmolak et al., 1980). The positive effect of y-gliadin 45 on gluten strength and cooking quality has been attributed to its genetic linkage with the low-molecular-weight (LMW) glutenin subunits (GS) identified as LMW-2 controlled at the Glu-B3 locus (Payne et al., 1984; Pogna et al, 1988). Studies have classified durum wheat according to several different LMW subunit models (Payne et al., 1984; Ruiz and Carillo, 1995a). These models have been inadequate, however, because they are a mixture of subunits controlled by different alleles, whereas durum wheat quality depends on specific LMW subunits encoded at the Glu-A3, Glu-B3 and Glu-B2 loci (Ruiz and Carrillo, 1995b; Nieto-Taladriz et al., 1997). It also has been reported that the superior gluten strength of LMW-2 types may be at least partially a quantitative effect, as LMW-2 proteins are expressed in greater amounts than LMW-1 proteins (Autran et al., 1987; D'Ovidio et al., 1999). LMW-2 types exhibit a strength range from moderate to very strong, yet the relationship between cooking quality and gluten strength is not clear for LMW-2 varieties with widely differing strength characteristics (Rao et al., 2001; Schlichting et al., 1998). Furthermore, the improvement in cooking quality associated with increasing drying temperature varies among LMW-2 varieties. In particular, the strongest gluten varieties do not show as large an improvement as some weaker varieties (Schlichting et al., 1998). When blended with weak gluten durum wheat, however, very strong gluten LMW-2 durum wheat types will enhance pasta cooking quality more than moderate strength LMW-2 types (Fig. 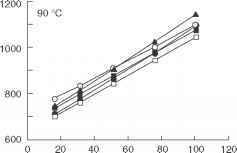 20.4) (Schlichting et al., unpublished results). Semolina millstreams exhibit a wide range in protein content which, as discussed earlier, impacts directly on pasta texture (Matsuo and Dexter, 1980). In particular, wheat flour produced as a by-product of semolina milling has a much higher protein content than semolina, imparting superior pasta firmness (Houliaropoulis et al., 1981). However, durum wheat flour and low-grade semolina streams are usually excluded from premium pasta products because of their negative impact on pasta colour due to a higher concentration of oxidative enzymes. Fig. 20.4 Regression lines (predicted firmness of cooked pasta vs blend level) showing the effect of blending semolina from a weak-gluten (LMW-1) variety Stewart 63 with semolina from five strong-gluten (LMW-2) varieties on cooked spaghetti firmness for spaghetti dried at 40° C, 70° C and 90° C.
of other ingredients to replace eggs (Kobs, 2000). For example, glycerol monostearate complexes with starch and decreases solubilization and migration of amylose out of the starch granule onto the surface of the pasta during cooking (Matsuo et al., 1986). This process decreases stickiness in products such as retortable pasta. It also helps to maintain the texture and mouthfeel of the pasta during many heating cycles (Giese, 1992; Kobs, 2000). Addition of glycerol monostearate alone can result in a decrease in cutting stress but, in combination with the addition of gluten protein and high-temperature drying, it can improve the cooking texture of farina spaghetti (Kim et al., 1989). The addition of L-ascorbic acid has also been reported to have a positive influence on pasta texture by improving the protein network (Milatovic and Mondelli G, 1991). This vitamin is reported to be used widely in many European countries (particularly eastern Europe) where plain white flour is utilized in pasta processing (Anonymous, 2003a). Other means of improving texture include increasing protein content by the addition of protein from other sources that can form complexes similar to gluten. Research has shown that not all protein improves pasta texture to the same degree. For example, Matsuo et al. (1972) showed that while egg albumin and wheat gluten improved cooked pasta texture, wheat gliadin and high-protein rapeseed meal and soybean flour did not show an improvement. Thus, vital wheat gluten or whey-protein concentrate (Kobs, 2000) can be added to semolina- or farina-based pasta to reduce stickiness and increase firmness. However, addition of soybean flour, which has a role in increasing the body's antioxidant status (Milo Ohr, 2003), must be made carefully since the soy protein impacts on pasta texture making it less firm and less resilient (Kim et al., 1989; Kobs, 2000). Various gums have been added to canned or frozen pasta products to enhance pasta texture (Teague, 1988) as well as being used to contribute to product fibre content (Andon, 1987). Edwards et al. (1995) showed that the addition of xanthan gums improved pasta firmness. Kobs (2000) reported, however, that while gums improve firmness the bite becomes rubbery. Other sources of dietary fibre obtained by the addition of oat or pea fibre have resulted in a deterioration of the cooked pasta texture (Dougherty et al., 1988; Edwards et al, 1995). Whole-wheat pasta is another source of dietary fibre, but the presence of the bran and germ particles interferes with the continuity of the gluten matrix causing a decrease in firmness (Edwards et al. 1995; Manthey and Schorno, 2002). Traditional coloured pasta made by the addition of tomato or spinach, for example, has been joined by more exotic flavoured pasta that contain herbs and spices such as basil, lemon pepper, garlic, parsley and red pepper (Giese, 1992). Kobs (2000), quoting industry experts, indicates that these ingredients will not influence the texture of cooked pasta as long as 5 % or less is present. Finally, it is possible to make unconventional pasta using flours from sources other than wheat including rice, starch, potato, maize, peas, lentils, etc. The protein present in these products is not able to form the gluten network characteristic of pasta made from wheat, and fortification with gluten protein or the use of different processing methods is required to give a reasonable product (Giese, 1992). By and large, the textural properties of these products are poor and they do not exhibit the firm bite characteristic of durum or common wheat pasta. 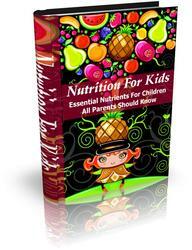 Get All The Support And Guidance You Need To Get The Right Nutrition For Your Kids. This Book Is One Of The Most Valuable Resources In The World When It Comes To Essential Nutrients For Children All Parents Should Know. Children today are more likely to consume foods that are delicious rather than nutritious, and most foods that come under the delicious category are usually either highly sweetened or salted, either way the delicious choice is not good for the child at all.